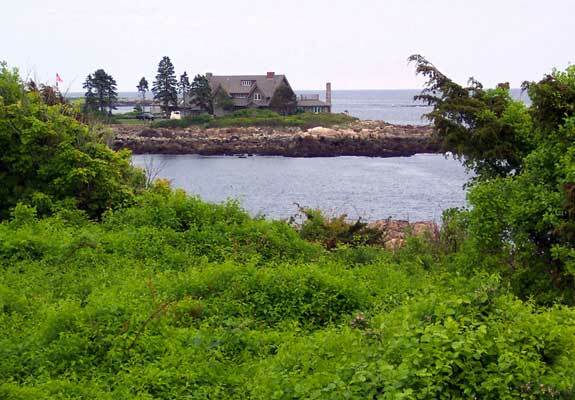 The Bush Family Home in Kennebunkport, Maine. Maine is the most eastern of all the US states, perched in the northeast corner of the country. Mainers or Down Easters as the state’s residents are known, are primarily composed of Yankee stock from English and Scot-Irish immigration. The second largest population group in the state include French immigrants: the Acadians who migrated in the 1700s and the Franco-Americans who followed primarily in the 19th century. Whether the presumed reticence of a stereotypical Yankee in combination with French joie de vivre has resulted in such an eclectic mix of famous or accomplished residents is unknown. Whatever the cause, Mainers have made significant contributions to politics, the arts, music, science, business and sports. Although the artistic Wyeth family roots have are primarily in Pennsylvania, they also have a significant presence in Maine. The Wyeth family spent their summers in the state and father Andrew married Mainer Betsy James. Betsy’s close friend, Christina, became the subject of Andrew’s famous piece, Christina’s World. Andrew and Betsy’s son, Jamie, showed precocious artistic talent as a third-generation artist depicting Maine. He maintains a home in Tenant’s Harbor and his work, his father’s and his grandfather’s are all part of the family collection at the Wyeth Center of the Farnsworth Art Museum in Rockland. King, a prolific author of novels, was born in Portland, earned his English degree from the University of Maine at Orono and now lives in Bangor. His home, with novelist and wife Tabitha, is said to be as idiosyncratic as the author. Fans can keep up with his newest works, film adaptations and plans at his official website. Tours of Maine offers a three-hour tour of approximately 30 sites in and around the Bangor area that are related to King’s life, work, book settings or film sites. An accomplished writer, Sara Orne Jewett, was born in coastal South Berwick, Maine. In addition to children’s fiction, poetry and short stories, Orne also wrote novels. Her work is known for his “regional, realistic depiction” of her contemporaneous characters. She never married but was friends with fellow Mainer and writer, Longfellow. The home she shared with her sister — now known as the Sara Orne Jewett House — is open for tours depending upon the season. Henry Wadsworth Longfellow was born in Portland in 1807 and both studied and taught at Bowdoin College in Brunswick. During his lifetime, he was so popular as a poet in the style of romanticism as to be a celebrity figure. The Song of Hiawatha, Evangeline, Paul Revere’s Ride, and The Courtship of Miles Standish are among his most famous poems. His home, The Wadsworth-Longfellow House, is Maine’s earliest house museum and has served as such since 1902. Except for the winter months, it is open to the public for tours. Elwyn Brooks White was a newspaper writer for The New Yorker and Harper’s, known to his friends as “Andy”. He was already an established writer when he began to write stories for his nieces and nephews in 1945. He and his wife moved to North Brooklin in 1957 where he continued to establish his reputation as an outstanding author of children’s literature and the source for proper writing in The Elements of Style. Many EB White photographs and related artifacts are on display at the Maine Memory Network and are held by The Aroostook County Historical & Art Museum. Finally, the Penobscot Marine Museum has sponsored celebratory events to honor White’s birthday in the past. Film and television actor and racecar driver, Patrick Dempsey, was born in Lewiston and raised in Buckfield. His most recent role is of a neurosurgeon on the television drama Grey’s Anatomy. He has organized and sponsored A Journey for Hope: The Dempsey Challenge — a walk, run, cycle race — since 2008 in Lewiston-Auburn as a fundraiser to fight cancer. Film director Ford was born in Port Elizabeth as “John Martin Feeney” or “Sean Aloysius O’Feeney.” He was best known for his production of Western-based films and won six Oscars for his work. The John Ford Center museum is part of Portland’s Maine Irish Heritage Center. The filmmaker also has a memorial statue depicting him working in a director’s chair in downtown Portland as well as a grouping of memorial markers celebrating his Oscar-winning films nearby at Gorham Corner. President George Bush, Sr. served as the 41st US President, from 1989 to 1993. His longtime family Maine summer retreat in Kennebunkport — first acquired by the family in the late 1800’s — became known as The Summer White House during his presidency. This restricted residence remains a family vacation home to the many members of the Bush family. Chamberlain was born in Brewer and obtained his undergraduate degree at Bowdoin College and studied at Bangor Theological Seminary for three additional years. He returned to teach at Bowdoin College until he voluntarily joined the Union Army. Chamberlain was promoted and returned to Maine after the Civil War’s end to be elected state governor four times. He retired from politics to become president of Bowdoin College but soon lost the support of the institution’s board as he attempted to transfer Bowdoin into a military school. Chamberlain turned to business and activity as a veterans’ advocate for the remainder of this long life. His home as an adult is now open to the public as the Joshua L. Chamberlain Museum in Brunswick. Rockefeller was born in Bar Harbor and spent summers in the area at the family summer home. When he was a boy, his family donated land for the establishment of nearby Acadia National Park. He later became governor of New York State and was named Vice-President under President Gerald Ford, from 1974 to 1977. Smith was born in Skowhegan. She eventually became the first woman to be elected to Congress as a member of the House of Representatives and later as a senator. Her first Congressional term came about when her husband, Clyde, died as a Congressman and she succeeded him. Smith became the first senator to publically denounce McCarthy’s tactics against communism and in 1964 became the first woman to have her name formally nominated to run as president. The Margaret Chase Smith Library in Skowhegan is managed by the University of Maine and is open to qualified scholars as a congressional research library. The Museum aspect of her library — including her home tours — is open to the public. Leon Leonwood Bean was born in Greenwood and later grew up in South Paris after the death of both his parents. He invented a waterproof boot that he was able to market after early failures. In 1917, he moved his company to Freeport and began to sell items by mail order at the same time as the US Postal Service began offering parcel post. The company’s commitment to customer service makes it a continued success today. In addition to the company’s famous outlet store in Freeport, plans are underway to make tours of LL Bean’s manufacturing plants available through Museum L-A. Milton Bradley, inventor of The Game of Life and other board games, was born in the Maine town of Vienna. After moving to Massachusetts, he became a lithographer and later an inventor of board games. According to an unsupported Wiki article, Bradley’s childhood home has been purchased by the Vienna Historical Society with plans for renovation. Chester was a grammar school dropout born and raised in Farmington. He invented earmuffs at the age of 15, the success of which led to a life of inventions. He is considered one of America’s 15 Outstanding Inventors by the Smithsonian Institution. The first Saturday in December is established by law as Chester Greenwood Day with celebrations that include a parade. The Stanley Brothers, Francis and Freelan, were identical twins born in Kingfield. Both became educators and continued their childhood habits of tinkering and business, developing an improved photographic plate later sold to Eastman Kodak. In 1890, the brothers developed the Stanley Steamer, an automobile based upon steam-power that briefly competed with Henry Ford’s internal combustion automobile. The Stanley Museum in Kingfield is dedicated to the brothers’ many inventions. Rachel Carson was an early ecologist, scientist and accomplished writer who worked for the US Bureau of Fisheries. She wrote scripts and brochures for the agency and newspaper articles on natural history. She published prize-winning The Sea Around Us in 1952 and her most famous work, Silent Spring, in 1962. In 1969, the Fish & Wildlife Service named a wildlife refuge close to Carson’s Maine summer home in honor of her work. The Rachel Carson National Wildlife Reserve in Wells serves to educate the public about Carson’s work and continuing legacy.